Edie Littlefield Sundby: “My grievance is not political; all my energies are directed to enjoying life and staying alive, and I have no time for politics. For almost seven years I have fought and survived stage-4 gallbladder cancer, with a five-year survival rate of less than 2% after diagnosis. I am a determined fighter and extremely lucky. But this luck may have just run out: My affordable, lifesaving medical insurance policy has been canceled effective Dec. 31. Gloria Cantor: Gloria Cantor of Florida has cancer — five brain tumors and tumors in her bones — but she won’t have the health insurance she has relied on for her treatment for much longer. A Zero Hedge Reader: My company, based in California, employs 600. We used to insure about 250 of our employees. The rest opted out. The company paid 50% of their premiums for about $750,000/yr. 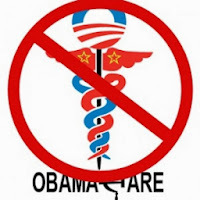 Under obamacare, none can opt out without penalty, and the rates are double or triple, depending upon the plan. Our 750k for 250 employees is going to $2 million per year for 600 employees. They can’t afford that to be sure. 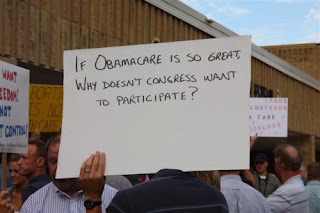 Obamacare will kill their propensity to seek medical care. More money for less care? How does that help them? Ashley Dionne: I graduated from The University of Michigan in 2009. In my state, this used to mean something, but even with a bachelor’s I was told I was too educated and would not stay. I watched as kids with GEDs and high school diploma’s took the low-paying jobs for which I applied. This is the real face of Obamacare and it isn’t pretty. George Schwab: George Schwab, 62, of North Carolina, said he was “perfectly happy” with his plan from Blue Cross Blue Shield, which also insured his wife for a $228 monthly premium. But this past September, he was surprised to receive a letter saying his policy was no longer available. The “comparable” plan the insurance company offered him carried a $1,208 monthly premium and a $5,500 deductible. A Middle Class Texas Family: Obamacare is named the “Affordable Care Act,” after all, and the President promised the rates would be “as low as a phone bill.” But I just received a confirmed letter from a friend in Texas showing a 539% rate increase on an existing policy that’s been in good standing for years. As the letter reveals (see below), the cost for this couple’s policy under Humana is increasing from $212.10 per month to$1,356.60 per month. This is for a couple in good health whose combined income is less than $70K — a middle-class family, in other words. Michael Cerpok: “I’ve worked hard because I’ve had to, and I’ve had to, because cancer runs in my family,” says Cerpok, who picked his current health insurance based on that family history. His monthly premium is just about half of his monthly take-home pay. That’s about to change because Michael just got a letter from his insurance carrier saying as of January 1, he would be dropped from coverage because of new regulations under Obamacare. Bill Elliot: Fox News host Megyn Kelly shared a heart rendering story Thursday night of a South Carolina man with cancer who is being forced to make what he sees as a life or death decision after his health insurance plan was cancelled because of Obamacare. Bill Elliot, who voted for President Obama, contacted “The Kelly File” via Facebook and said he can no longer afford to pay his medical bills and does not want to take on the new costs because he does not want to put a “burden” on his family, according to Fox News.